This is the story of an Andean paradise lost - lost after a devastating mercury spill. On June 2nd, 2000 at the Yanacocha goldmine in the Peruvian Andes, 151 kilograms of liquid mercury spilled over a 25-mile long area, contaminating three mountain villages, including Choropampa. The environmental catastrophe turned this quiet village into a hotbed of civil resistance. The mine, jointly owned by a Peruvian company, the World Bank, and the Newmont Mining Corp of Colorado, insists the problem was quickly resolved, while villagers tell a starkly different story. 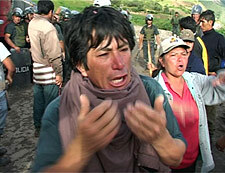 CHOROPAMPA - THE PRICE OF GOLD follows their valiant struggle for health care and justice over a two-year period. More than 900 people were poisoned from the spill. Nearly two years afterward, they continue to suffer the grave, debilitating effects of mercury poisoning. Proper medical care has not been provided to the villagers, and their health continues to deteriorate. Villagers liken the mine owning foreigners to modern-day conquistadors, evoking the impoverished region's troubled, historical relationship with gold. A farmer tells the story of Atahualpa, the Inca ruler who was captured and murdered, not far from Choropampa, by Spanish explorers hungry for the precious metal. The treachery continues today he says, "Foreigners have been coming and taking our gold and Peru remains as poor as ever…"
But when the young, dashing Lot Saavedra is elected mayor the town finds new hope. Saavedra promises to win health care and fair compensation for the victims, and takes on corrupt politicians, company officials, and shady medical experts to do so. Months of tense, frustrated talks culminate in the dramatic blockade of the mine's vehicles, but cracks in the community threaten to undermine the villagers' resolve. In cinéma vérité style, illustrated by archival footage, CHOROPAMPA - THE PRICE OF GOLD exposes the global gold trade's nasty underbelly, and makes it clear that the village was sacrificed to American business interests. The story is a poignant reminder of the real cost of gold. Follows the efforts of a small Peruvian town over five years as they fight government efforts to sell the mineral rights under their homes to a multi-national mining company.